The sad photo from the Christchurch shooting funerals. ‘I don’t want to be left alone.’ This week, Zaid said goodbye to his father and brother. 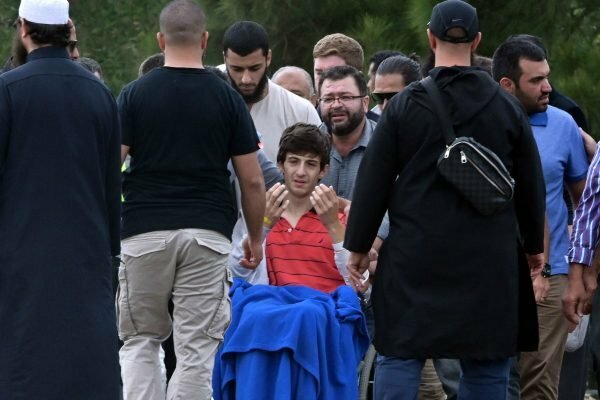 One week ago, Zaid Mustafa was inside the Al-Noor mosque in Christchurch with his father, Khalid, and older brother, Hamza, as they gathered for their afternoon prayer. Zaid was shot in the leg when a terrorist opened fire in the mosque in a horror terror attack against the Islamic faith. Although Zaid survived his injuries, his father and brother were among the 50 people who were killed in the mass shootings. On Wednesday, Khalid Mustaf, 44, and Hamza Mustaf, 16, were the first of the victims to be buried. Zaid attended the funerals at the Memorial Park cemetery in Christchurch, as hundred of mourners gathered to pay their respect to the families of the victims. A guest of the ceremony told Newshub: "The son wanted to stand. He couldn&apos;t. He tried and couldn&apos;t. A wound in his leg wouldn&apos;t allow him too." The Mustafa family moved to New Zealand as refugees from Syria last July - only eight months before Khalid and Hamza were murdered. Prime Minister Jacinda Ardern referred to the Mustafas family on Wednesday, saying the Syrian refugees "should have been safe here." Zaid&apos;s brother Hamza Mustafa was a Year 12 student at Cashmere High School in New Zealand. "He was really good at sports, he was good at everything, like horse riding, fishing, sprints, everything," a friend of Hamza and funeral attendee told Newshub. "It was really sad that I won&apos;t be able to see them again."